The general cargo ship Anna sank in Mediterranean Sea on 50 nautical miles north-east off Misrata, Libya. The vessel, which was en route from Istanbul to Misrata, suffered crack in the hull in the cargo hold area and started getting water ingress. The crew sent distress signal and requested immediate evacuation. First to the distress responded the Cosco Shipping’s vessel Da Ji, which was 12 nautical miles away from the troubled cargo ship. Immediate communications between the vessels were established and the rescue operation was initiated. 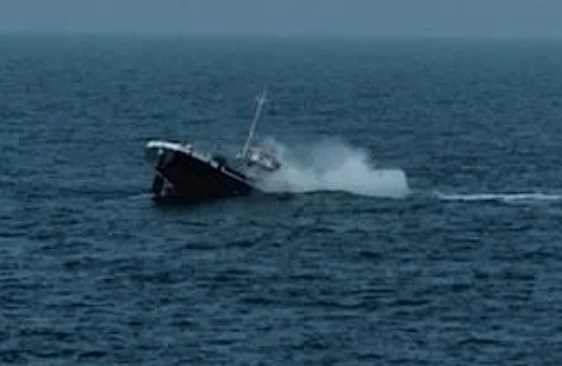 The ten crew abandoned the sinking general cargo ship Anna into a life boat, seeing that their vessel capsized several minutes later. About an hour later, all the people were rescued and taken on board of the Cosco Shipping’s vessel Da Ji. There are no reports about injuries and all the people were transferred to shore. “By 0743 hours, the cargo ship sank at the position of 3248.9N, 01603.7E, and Da Ji’s crew hastened the rescue operations”, said the official statement of Cosco Shipping, which is parent firm of Cosco Shipping Specialised Carriers. “Fortunately, the rescue operation was a success and by 0850 hours, all 10 crew members of Anna were saved and no injuries were sustained”, adds the statement. The investigation for the root cause of the accident is under way. The vessel has several tons of heavy fuel on board, but there are no reports about water pollution, if area is monitored at all. The general cargo ship Anna (IMO: 8027676) has overall length of 100.00 m, moulded beam of 11.00 m and maximum draft of 4.70 m. The deadweight of the ship is 2,960 DWT and the gross tonnage is 2,265 GRT. The freighter was built in 1981 by MAN Ghh Dock and Schiffbau in Duisburg, Germany. The general cargo ship Da Ji (IMO: 9768538) has overall length of 180.00 m, moulded beam of 28.00 m and draft of 7.50 m. The deadweight of the ship is 28,612 DWT and the gross tonnage is 21,992 GRT. The ship is owned and operated by Cosco’s subsidiary – Cosco Shipping Specialised Carriers.